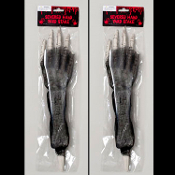 2-piece Set Budget Scrawny Life-Size Human Anatomy Bones These bloody skeleton hand lawn stakes will bring the horror to your graveyard scene. Molded plastic hands with partial arm bones are wrapped with tattered black gauze shrouds. Set of 2 Budget Skeleton Arms - BOTH SAME ARM--NOT right and left. Need some skeleton parts but don't want to spend an arm and a leg? Look no further! Each arm portion only, approx 12-inch long x 1.75 to 3-inch wide. Attached 2.5-inch long plastic stakes that you insert into the ground for displaying. Includes 1 set of hands. Overall measurement of Horror Hands Lawn Stakes is 14.5-inch long x 3-inch wide. Make your own zombies, graveyard scenes, dungeon decor, gothic props, etc. Ideal for ZOMBIE prop building, graveyard haunt, cemetery scene, pirate prop or anatomical display. Make no bones about it - these props are creepy! Approx 14.5-inch (36.25cm) long x 3-inch (7.5cm) wide at widest and 1.75-inch (4.38cm) at the narrowest part of the bone. Stake approx. .75-inch and tapers to a point.